The current logo used since Mario Kart DS. Mario Kart (Japanese: マリオカート Mario Kāto) is a series of kart racing games developed and published by Nintendo as a spin-off of its flagship Mario franchise. It was inaugurated in 1992 with its debut entry, Super Mario Kart for the Super Nintendo Entertainment System, which was critically and commercially successful. There have been a total of 14 titles in the series: 5 for home consoles, 3 portable games, 4 arcade games co-developed by Bandai Namco Entertainment, a port, and an upcoming mobile game. The success of Mario Kart has spawned many cartoon-style racing games published by various gaming companies from the 16-bit generation onwards. It has also been referenced in the Paper Mario role-playing series and inspired several stages in the Super Smash Bros. fighting games. The games in the series have sold a combined total of over 100 million copies worldwide. The modern Mario Kart series is widely considered to trace its spiritual origins to the Famicom Grand Prix games, which were released for the Japan-only Famicom Disk System add-on; these were the first Nintendo racing games to feature Mario as a player-character. Following the Japanese launch of F-Zero, a Super Nintendo Entertainment System game which was exclusively single-player, Nintendo developers decided to create a two-player racing game for that console as a follow-up. They made a prototype that featured a generic "guy in overalls"; it was decided that Mario characters and concepts be included when the developers added Mario driving one of the karts, out of curiosity as to how the game would look, and were satisfied with it. Thus, the Mario Kart series was born, with its first title, Super Mario Kart, released for the SNES on August 27, 1992. Development of the first Mario Kart game was overseen by Shigeru Miyamoto, then the general manager of Nintendo's EAD division, who is best known for creating the Mario franchise and other successful Nintendo properties. Darran Jones of Imagine Publishing's magazine NowGamer attributed the original success of Mario Kart to its use of the Mario characters and to being a new type of racing game. 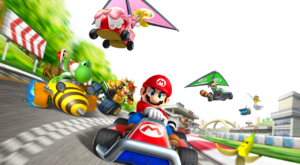 Mario and other characters racing on one of the circuit courses in a group artwork for Mario Kart 7. In the Mario Kart series, players compete in go-kart races, distributed among several single-player and multiplayer modes, and control one of a selection of major Mario franchise characters. Up to twelve (originally eight) characters can compete in each race. When the characters are ready to begin racing in the starting grid, Lakitu comes in with a traffic light hanging from a fishing pole, which starts the countdown; when the light turns green, the race officially begins. During the race, the player's viewpoint is from behind or in front of his or her kart. The goal of the game is to either finish a race ahead of other racers, who are controlled by the computer and other players, or complete a circuit in the fastest time. Question mark boxes are arrayed on the race tracks and give power-up items to a player-character if their vehicle passes through them. Common power-ups include the Super Mushroom, which gives players a speed boost; the shells of Koopa Troopas, which can be thrown at opponents; banana peels, which can be laid on the track as hazards; Boo, who turns the player's kart invisible so that obstacles will not hit it and steals for them an item from another racer; a Bullet Bill, which sends the player rocketing ahead, plowing over other racers who get in the way; lightning bolts, which a player can use to electrocute and weaken all of the other racers; and the Starman, which renders the player's kart temporarily invulnerable to attack. The type of weapon received from an item box is often random, though sometimes influenced by the player's current position in the race. For example, players lagging far behind may receive more powerful items while the leader will only receive small defensive items. This gameplay mechanic is designed to give other players or computers a realistic chance to catch up to the leading player. In some games, lines of coins are found on the courses, which if run over and collected, will increase a kart's top speed and can be used to unlock kart parts. Having coins also helps players when their kart is hit by another: instead of spinning and losing control, they lose a coin. Coins are also lost when karts are struck by power-ups or fall off the tracks. The series also features advanced maneuvers such as drifting (also called power sliding), which allows a kart to rapidly turn in a direction preventing the need to brake; and hopping, which helps a kart to avoid obstacles or off-road parts and sometimes can be used to execute tighter turns (the kart makes a short hop and turns in the air, speeding off in the new direction when it lands). Many course themes recur throughout the series, including circuit, dirt, off-road, beach, desert, snow, and haunted tracks. Most courses are based on an existing Mario location (such as Bowser's Castle), but there are a number of courses that have not appeared elsewhere, such as Rainbow Road. Each game in the series includes at least 16 original courses and up to 6 original battle arenas. Each game's tracks are divided into four "cups," or groups in which the player has to have the highest overall placing to win. Most courses can be done in three laps. Course outlines are marked out by impassable barriers and feature a variety of bends, ranging from sharp hairpins to wide curves which players can drift around. Numerous obstacles appear on the tracks, ranging from generic obstacles to those themed after the Mario games. For example, the Bowser's Castle tracks feature Thwomps and sometimes Fire Bars or Lava Bubbles; beach courses may feature crabs and/or Cheep Cheeps; and the Mario Circuit tracks, depending on the game, may incorporate anything from pipe barriers to franchise-staple enemies like Piranha Plants and Chain Chomps. Another common type of obstacle is off-road sections which slow down the karts, such as shallow water or mud bogs. The first game to feature courses from previous games was Mario Kart: Super Circuit, which contained all of the tracks from the original SNES game. Starting with Mario Kart DS, each entry in the series has featured 16 "nitro" original courses and 16 "retro" tracks drawn from previous titles, spread across four cups each. The four "nitro" cups ― the Mushroom Cup, Flower Cup, Star Cup, and Special Cup ― have been recurring cups throughout the entire series, while the "retro" cups from the more recent installments are the Shell Cup, Banana Cup, Leaf Cup, and Lightning Cup. As the player progresses through the cups, each is ostensibly more difficult than the one before it. In Mario Kart 8, 16 additional tracks are available across two downloadable packages, eight for each package downloaded, including seven retro courses, four original courses, and five courses based on other Nintendo franchises, namely Excitebike, F-Zero, The Legend of Zelda, and Animal Crossing. The Mario Kart series' player-character rosters generally consist of memorable characters from the Mario universe, including the main protagonist Mario; his brother Luigi; his love interest Princess Peach; his sidekick Yoshi; his friends Toad, Princess Daisy, and Rosalina; his antagonists and rivals Donkey Kong, Wario, and Waluigi; and his nemesis Bowser; among others. Each character's kart has different capabilities with differing levels of top speed, acceleration and handling. Since Mario Kart 64, all player-characters have been grouped into one of three distinct weight classifications. Smaller characters, labeled as "lightweights," have high acceleration but low top speeds, and lose a minimal amount of speed when off-road but are easily knocked aside by heavier opponents. Medium-sized characters, or "middleweights," have an equal balance of weight, top speed, and acceleration, and lose a moderate amount of speed when off-road. The largest characters, labeled as "heavyweights," can easily knock aside most opposing racers, have high top speeds but poor acceleration, and lose great amounts of speed when off-road. Each installment of the Mario Kart series features a variety of single and multiplayer modes. The four modes that recur most often in the series are Grand Prix, Time Trial, VS, and Battle Mode. In Grand Prix, one player is required to race against eleven (formerly seven) computer-controlled characters in a "cup," a series of four races (five in Super Mario Kart). Mario Kart games typically have four recurring difficulty levels: 50cc, 100cc, 150cc, and an extra "Mirror" mode (where tracks are inverted left-to-right); starting in Mario Kart 8, a fifth difficulty level, 200cc, was added. As the player progresses through the cups, the courses become more difficult, and as the difficulty level increases, the vehicles go faster. Players earn points according to their finishing position in each race. In earlier games, if a player finishes in a lower position, they must replay the race and may not proceed until a higher placing is achieved. The racer with the highest number of points after all races have been completed wins a trophy: bronze for third place, silver for second, and gold for first. Grand Prix is also playable in multiplayer mode for up to four players, though this does not affect the rest of the gameplay rules. Grand Prix is known as Mario Kart GP in the first three games. In Time Trial mode, players race against the clock through the same tracks that are present in Grand Prix mode in 150cc engine class, attempting to set the fastest time possible. There are no opponent racers or item boxes, though the player will always begin each race with three Mushrooms in reserve. For any given course the shortest total times are saved, and the shortest single lap time of any race is also saved. The fastest time is saved as a ghost, a copy of the player's performance, which the player can race against later. In Mario Kart 8 Deluxe, 200cc Time Trial has been added. The VS mode involves player(s) racing a track of their choice and also feature customized rules such as team racing and item frequency. VS mode has been changed several times throughout the series. In earlier games, VS mode is exclusive to multiplayer without any computer-controlled racers. Starting from Mario Kart DS, VS mode can be played either single player with CPU racers, or multiplayer with or without CPU racers. A notable exception is Mario Kart 7, where single-player VS races are removed and limited only to multiplayer, but the rules remain the same as in Mario Kart DS and later installments. In Battle Mode, players go head to head on one of a number of dedicated Battle Mode courses, usually designed as closed arenas. Each player starts with three balloons and loses a balloon with every hit sustained; the last player possessing at least one balloon wins. In addition to the classic battle game, different variants of this mode were added as the series progressed, including one that involves capturing a Shine Sprite and maintaining possession of it for a certain period of time; and one that involves throwing Bob-ombs at other players to earn points. Starting with Mario Kart Wii, there is a time limit for each battle. For Mario Kart 8, the battles take place on race courses. In Mario Kart Wii, Mario Kart 7, and Mario Kart 8 Deluxe, the player will respawn after losing all balloons, instead of getting eliminated. Super Nintendo Entertainment System Super Mario Kart was the first entry in the series, released for the SNES in 1992. The game has a total of eight playable characters who, when computer-controlled, use special power-up items specific to each character (such as eggs for Yoshi). The twenty tracks in this game, based on locations in Super Mario World (such as Donut Plains), are all short in length compared to other tracks in the series; thus, they are raced in five laps instead of the usual three. Whereas most other playable characters have reappeared in all later entries in the series, Koopa Troopa has only returned intermittently, and Donkey Kong Jr. would never again be used as a playable character, except for two Mario Tennis games. Unlike other games in the series, Super Mario Kart allows players only a limited number of lives, which are lost whenever a racer loses and is "ranked out". A notable aspect of the game's presentation is its use of the SNES's Mode 7 graphics technology, which allows for free rotation and scaling of planes to give a three-dimensional appearance. The game was released for Wii, Wii U, and New Nintendo 3DS via Virtual Console, as well as for Super NES Classic Edition. Nintendo 64 Mario Kart 64, launched in 1996/1997 for the Nintendo 64, was a vast improvement from the SNES original. It moved the series to polygon-based true 3D computer graphics for track design, allowing for track features that were not possible with Mode 7, such as bridges, walls, pits, and elevation changes; however, the characters and items remain 2D pre-rendered sprites. Other new additions include digital voice acting, 4-player support, the modern character weight classification system, Mirror mode, ghost data for Time Trial courses, and a new item called the Spiny Shell which targets and attacks the player in the lead. The game features 16 normal race courses, as well as four battle courses. Though there are still eight playable characters, two new characters are introduced: Wario (replacing Koopa Troopa) and Donkey Kong (replacing Donkey Kong Jr.), both of whom have reappeared throughout the series. This game has been released for Wii and Wii U through Virtual Console. Game Boy Advance Mario Kart: Super Circuit for Game Boy Advance, developed by Intelligent Systems, was released in 2001 as the first Mario Kart title for a handheld console. It retains the traditional elements of Mario Kart established by its predecessors; however, it is not without its new additions. Mario Kart: Super Circuit is the first entry in the series to feature unlockable retro tracks from a previous installment (in its case, the Super Mario Kart tracks). It is also the first installment where, in addition to the usual trophy, the player is also awarded with a ranking based on their performance. During a linked VS mode with only one cartridge, players can only choose from the four SNES Mushroom Cup courses, and must play as a Yoshi of a specific color. If all players have a cartridge, all racers and courses are available. This is the first Mario Kart game to have a feature that allows players to swap ghost data, in its case via the use of the GBA's Link Cable. This game has been released for Nintendo 3DS and Wii U through Virtual Console, although the former release is only obtainable through the Nintendo 3DS Ambassador Program. Nintendo GameCube Mario Kart: Double Dash! !, released in 2003 for the Nintendo GameCube, introduced a number of new gameplay features. The most prominent feature is co-op gameplay with two riders per kart, where one player drives and the other uses items. This is also the first game to allow everyone to move on regardless of which position they earned after each race. In addition to 9 of the 10 characters who return from previous installments (excluding Donkey Kong Jr.), 11 new playable characters are added: Diddy Kong, Bowser Jr., Birdo, Princess Daisy, Waluigi, Koopa Paratroopa, babies Mario and Luigi, Petey Piranha, King Boo, and the newly-created Toadette. Each pair of drivers is assigned their own unique special item (e.g. fireballs for Mario and Luigi, or giant bananas for Donkey and Diddy Kong). Individual characters also gain their own unique custom-designed karts. Another new addition is the "All-Cup Tour," which has the player race in every track at the same time; once this is cleared on the highest difficulty setting, the player can unlock a "Parade Kart," which can be used by any character of any weight. Nintendo DS Mario Kart DS, released for the Nintendo DS in 2005, is the second title to be released on a handheld gaming system. It returns to the one-person karts used before Double Dash! !, and includes a new Mission Mode, where the player must complete eight missions (ranging from collecting coins to attacking enemies) in one of seven sets, and engage in battles with bosses from Super Mario 64 DS. The game makes use of the DS's dual-screen features by using the top screen to display the racer's kart and the bottom screen to show either a course overview or a bird's-eye view of the immediate vicinity. Dry Bones and R.O.B. (and Shy Guy for one-cartridge multiplayer mode) make their Mario Kart debut in this game, with this being R.O.B. 's sole appearance in any game using the Mario branding. Mario Kart DS features a multiplayer mode where players can race each other using the DS Download Play feature or a multi-card wireless LAN service; additionally, it was also playable online via the Nintendo Wi-Fi Connection service until its termination in 2014. Furthermore, the use of unlockable retro tracks from earlier installments was reintroduced here and made a permanent feature of the series. This game has been released for Wii U via Virtual Console. Wii Mario Kart Wii was released for the Wii in 2008. For the first time in the series, the player can race using motorcycles (labeled in-game as "bikes") and perform tricks while driving that produce speed boosts, such as mid-air stunts, slipstreaming, and wheelies. The game is primarily played using the plastic Wii Wheel accessory, which uses the controller's motion sensing to simulate operating a steering wheel. The game features 24 playable characters, the largest roster of the series at the time (Baby Daisy makes her debut in the Mario franchise, and other new additions to the Mario Kart series include Baby Peach, Funky Kong, Dry Bowser, and Rosalina; Mii characters saved in the console's Mii Channel are also playable). The concept of retro tracks is expanded to the Battle mode, with one retro battle course from each game in the series. When Nintendo Wi-Fi Connection was in existence, Mario Kart Wii allowed the VS and Battle modes to be played by up to twelve participants, and also featured the "Mario Kart Channel," which was available as an optionally selectable channel on the Wii Menu and allowed players to check their regional or global Time Trial rankings, send and receive ghost data, and participate in worldwide tournaments on modified courses with special objectives. Nintendo 3DS Mario Kart 7, released in 2011 for the Nintendo 3DS, features optional 3D stereoscopic graphics and can be played using the console's gyroscope, which allows players to race in first-person and steer vehicles simply by turning the game system. Other features unseen in previous installments include the ability to build customizable vehicles with unlockable parts such as frames or tires; retractable hang gliders, which allow players to glide through the air, skipping over parts of the track or locating new routes/shortcuts that are otherwise inaccessible; fully submersible karts; and segments of tracks that are completely underwater. The game features 4 new characters: Metal Mario, Lakitu, Wiggler, and Honey Queen. This is also the first Mario Kart game where Shy Guy can be played as without playing in multiplayer mode. The player can play online via Nintendo Network, participating in races or battles with up to seven other players, and exchange game data with other Nintendo 3DS consoles. Two of the new courses are set on Wuhu Island from the non-Mario game series Wii Fit. Wii U Mario Kart 8, released for the Wii U in 2014, introduces anti-gravity sections that allow players to drive on walls and ceilings, allowing for more alternate paths in courses. In these sections, a player can bump into other racers or special bumpers to trigger a Spin Boost, which gives them an extra speed boost. The game also introduces all-terrain vehicles (ATVs), allows the player to view replay data from others and upload highlights to YouTube via "Mario Kart TV", introduces the Koopalings as new playable characters, and allows up to four people to play in Grand Prix races. Baby Rosalina and Pink Gold Peach are also introduced as new characters to the Mario franchise. Additional characters, vehicles, and tracks have been released as downloadable content, including actual Mercedes-Benz vehicles. Characters that have been released as add-on content include Tanooki Mario, Cat Peach, the returning Dry Bowser, Link from The Legend of Zelda, and the Villager and Isabelle from Animal Crossing; tracks themed after various non-Mario game series have also been made available as add-on content. Additionally, Mario Kart 8 is notable for being the first game in the series to boast HD graphics and live-orchestrated music, as well as the first to receive post-release updates adding new features and enhancements, including rearranged post-race options, 200cc, and support for Nintendo's amiibo line of figurines. Arcade Machine Mario Kart Arcade GP was the first Mario Kart title for arcades, released in 2005. Designed for Nintendo's Triforce arcade board and developed by Namco, the game features 11 playable characters and 24 tracks. As in other arcade racing games, players are required to drive to the goal under a limited amount of time. The machine also features many more items than the Nintendo titles, and houses a camera that will take a photograph of the player's face to display above the player-character during multiplayer races. This is the first Mario Kart game where characters originating from outside the Mario franchise and its sub-series are playable, as three characters from the Pac-Man games, namely Pac-Man, Ms. Pac-Man, and the ghost Blinky, are playable. Arcade Machine Mario Kart Arcade GP 2 was released to arcades in 2007/2008. It features the same playable characters as its predecessor, but also adds Waluigi and crosses over Mametchi from the Tamagotchi series (the former being previously playable in the main Mario Kart series, and the latter making their only Mario appearance overall). This game also introduces unique karts for each character, as in the main games from Mario Kart DS onward; more items unseen in the normal installments; and color commentary, which can be toggled on or off at any time prior to starting the race. Arcade Machine Mario Kart Arcade GP DX is the third Mario Kart game for arcades, released in 2013. It adds Mario Kart 7's gliders and submersible karts, plus new playable characters to the arcade installments, Bowser Jr., Rosalina, Metal Mario, Baby Mario, Baby Peach, Daisy, King Boo and Lakitu, the latter six being characters added through game updates (while King Boo could only be obtained through a limited-time event). Additionally, Don-chan crosses over from the Taiko no Tatsujin series, and Pac-Man is redesigned to use his appearance from the animated television show Pac-Man and the Ghostly Adventures. Two new modes are introduced as well: "Alter-Ego," which uses online functionality to allow players to race against ghosts set by other players; and "Team," which allows two players to face against two computer-controlled opponents, and combine their karts to form a more powerful vehicle. Arcade Machine Mario Kart Arcade GP VR is a Mario Kart arcade game for virtual reality arcades, released by Bandai Namco in Japan. Instead of using Item Boxes, the game uses balloons to store items, and the player must make hand motions (differing depending on the item used) to use said item. Four arcade cabinets are present in a given location, where players can play as Mario, Luigi, Peach, and Yoshi respectively. A CPU-controlled Bowser and Wario also appear in races. Nintendo Switch Mario Kart 8 Deluxe is an enhanced port of Mario Kart 8 for the Nintendo Switch, released in 2017. In addition to most of the original release's base and DLC content, the port includes additional features. Battle Mode is reworked to be similar to the format from previous Mario Kart games, and comes with eight exclusive arenas of its own. Boo and Super Mario Kart's Feather are reintroduced as items after long being absent from the series' item lineup, with the latter being exclusive to Battle Mode; and players are now allowed to carry two items at once. More playable characters are added to the roster: Bowser Jr., Dry Bones, King Boo, and Gold Mario, who return from previous games, as well as the girl and boy Inklings from Splatoon. Other additional content includes new racing suits for Miis unlocked via amiibo, a simpler steering option, and additional kart parts for customization. This section is about an upcoming game. Editors must cite sources for all contributions to this section. Edits that do not follow this standard may be reverted without notice. iOS, Android Mario Kart Tour is an upcoming Mario Kart game for mobile devices. It was announced at Nintendo's financial briefing on January 31, 2018 and was originally set to release during the fiscal year ending March 2019, but was delayed to summer 2019. At one point, there was also a game in the series planned for the Virtual Boy in 1995. Tentatively entitled VB Mario Kart, it was likely to be the first sequel to Super Mario Kart. 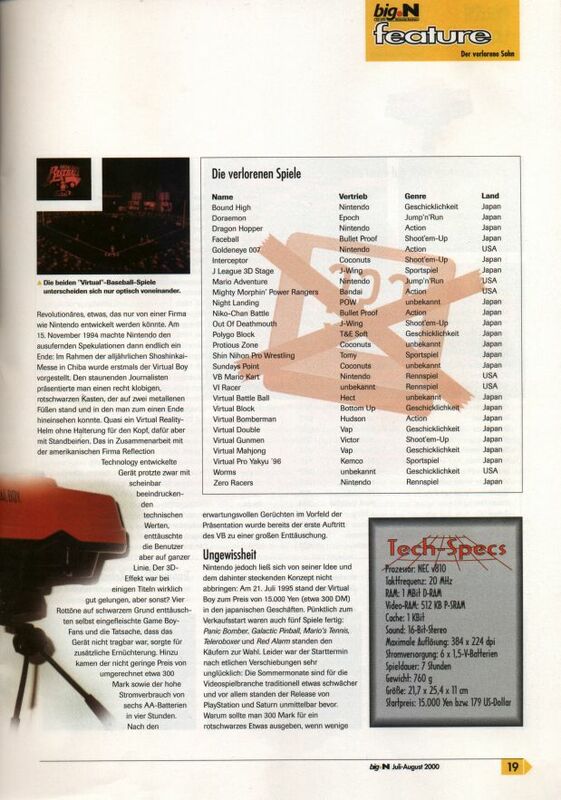 The game was canceled due to the Virtual Boy's failure, and was never reported in the media until revealed in the August 2000 issue of German gaming magazine The Big N, along with other shelved projects for that system. Even though the GBA already had its own official Mario Kart game in Super Circuit, a tech demo called Mario Kart XXL was made for that system by Manfred Trenz of the company "Denaris Entertainment Software". The Mario Kart series has been referenced twice in the Paper Mario role-playing game series. Luigi references it in an "adventure" of his which he recounts between chapters of Paper Mario: The Thousand-Year Door, where in the third of his stories, he states that he visited a location called "Circuit Break Island" where kart races are organized every day. Later, in Paper Mario: Color Splash, once all six Big Paint Stars have been retrieved, Luigi drives his kart on Rainbow Road to transport Mario to Bowser's castle to defeat him and restore peace to Prism Island; when Bowser (who has been transformed by black paint) is reverted to normal upon his defeat, he asks Mario if they have a kart race scheduled. Additionally, several stages based on Mario Kart have appeared in the Super Smash Bros. series: Super Smash Bros. Brawl features a Mario Circuit stage based on Figure-8 Circuit from Mario Kart DS, Super Smash Bros. for Nintendo 3DS features a Rainbow Road stage based on its appearance in Mario Kart 7, and Super Smash Bros. for Wii U features a Mario Circuit stage based on its appearance in Mario Kart 8, as well as reusing the Mario Circuit stage from Brawl. Although not actually shown in the first Super Smash Bros. for the Nintendo 64, the franchise (which at that time had been composed of just Super Mario Kart and Mario Kart 64) was alluded to in a promotional ad for the game in Nintendo Power, where it mentioned that Nintendo's famous cast had previously "raced go-karts" when announcing their new role in the fighting ring. Mario Kart has also crossed over into the Fortune Street series, where its DS installment features a playable Mario Circuit based on its Double Dash!! and DS versions, and the Wii follow-up features a Mario Circuit whose design is based on Mario Kart Wii. There are also stages based on Mario Kart in the Mario & Sonic series; for example, Olympic Winter Games features Mario Circuit from Mario Kart Wii, Bowser's Castle from Super Circuit, and Sherbet Land from Mario Kart 64 in its ski cross, ice hockey, and curling dream events respectively. Rainbow Road from Mario Kart 64 is featured in F-Zero X; figurines of Mario, Peach, and Bowser racing in their karts appear as dog toys in Nintendogs; and the Animal Crossing series features Mario Kart items in City Folk and references the series in certain lucky tickets in New Leaf. Other games that have referenced Mario Kart include Kirby: Triple Deluxe and Planet Robobot, Dig Dug: Digging Strike, Minecraft, Tomodachi Life, and Wii Sports Resort. The Mario Kart series has had a wide variety of playable characters throughout its history, including characters originating from outside the Mario franchise. Mario, Luigi, Peach, and Yoshi are the only characters to have been playable in every released installment. 1 - In Mario Kart: Super Circuit, when playing VS Mode with a single cartridge, players control a Green, Red, Light Blue, or Yellow Yoshi. 2 - This character is unlockable in the respective game. 3 - In Mario Kart DS and Mario Kart 7 Download Play matches, players without the game control a randomly-colored Shy Guy. 4 - In Mario Kart Wii, Miis are selectable as two different characters: Mii Outfit A and B. 5 - This character was added to Mario Kart Arcade GP DX in an update. 6 - Mario Kart Arcade GP DX features the following character palette swaps: Fire Mario, Tanooki Mario, Ice Luigi, Red Yoshi, Black Yoshi, Blue Toad, Strawberry Don-chan, Hero Don-chan, Dry Bowser, and Gold Mario. 7 - Eight palette swaps are available for this character in Mario Kart 8 after purchasing both DLC Packs, or among the base content of Mario Kart 8 Deluxe. 8 - This character is available in Mario Kart 8 as purchasable add-on content. 9 - A male and female variant of this character is available in Mario Kart 8 and/or Mario Kart 8 Deluxe. 10 - This character appears in Mario Kart 8 Deluxe as a palette swap for Metal Mario. 11 - In Mario Kart Arcade GP VR, each character is restricted to a specific arcade cabinet. 12 - In Mario Kart Arcade GP DX, this character was playble during a limited-time event, and could be unlocked for permanent use through said event. The Mario Kart series has spawned a range of merchandise over the years. Scalextric produced a slot car racer set based on Mario Kart DS, including figures based on Mario, Donkey Kong, Wario, and Luigi. A line of radio-controlled karts has also appeared based on the series, featuring Mario, Donkey Kong, and Yoshi, controlled by Game Boy Advance-shaped controllers. Mario Kart 64 has been promoted with figures of Mario, Luigi, Yoshi, Donkey Kong, Wario, and Bowser made by Toybiz; and another figurine line featuring all eight player-characters available only in Japan. There is also a line of "Sound Drops" inspired by Mario Kart Wii featuring eight of the game's sound effects, and a land-line telephone featuring Mario holding a lightning bolt while seated in his kart. K'Nex produced sets with tracks from the game and figures of Mario, Luigi, Yoshi, Donkey Kong, and Bowser in karts and bikes. These have been released to promote Mario Kart Wii, Mario Kart 7, and Mario Kart 8. McDonald's released an eight-character set of Happy Meal toys based on Mario Kart 8, where the characters' karts were customizable with stickers. Nintendo itself has also offered Mario Kart-related merchandise, such as a soundtrack for Mario Kart 64 offered by mail; and varying pieces of merchandise through the Club Nintendo customer rewards program, such as a Mario Kart Wii-themed stopwatch, gold trophies modeled after those in Mario Kart 7, and a CD featuring the soundtrack of Mario Kart 8. European casino game manufacturer Maygay produced a slot machine game based on Mario Kart 64, in which the objective is to race around the track to get the "super jackpot" bonus in the center, along the way using powerups and collecting cash from the reels, the three central prize trails, or the six character-based special features. The Mario Kart series has received widespread critical and fan acclaim. On Metacritic, all entries in the series hold aggregate review scores of 82 to 91 out of 100, except for Super Mario Kart, which was never reviewed there. On GameRankings, all eight main Mario Kart installments hold very high approval ratings, ranging from 82% (Mario Kart Wii) to 94% (Super Mario Kart). The Mario Kart games have also been praised by many other gaming reviews publishers including Edge, IGN, The Age, GameSpot, and Official Nintendo Magazine among others. In its 250th issue, Nintendo Power stated that the series was one of the greatest multiplayer experiences, citing the diversity in game modes as well as the overall entertainment value. The Mario Kart series has also been lauded by the Guinness Book of World Records, which gave it six records including "First Console Kart Racing Game," "Best Selling Racing Game," and "Longest Running Kart Racing Franchise," while also naming its SNES debut game the top console game of all time based on initial impact and lasting legacy. The games in the series have sold a combined total of over 100 million copies worldwide, with Mario Kart Wii as the best-selling entry, at 36.83 million. Nintendo assigned the Player's Choice marking label to all four of those Mario Kart games that were in existence during its time, and its successor label, Nintendo Selects, was given to Mario Kart Wii in Europe and Oceania. The original Super Mario Kart has been listed among the greatest games ever made by a number of organizations. IGN, in listing it as the fifteenth-best game ever, called it "the original karting masterpiece." It has also been credited with creating the kart racing subgenre of video gaming, as many developers have attempted to replicate its success, including Sega with Sonic Drift, Ubisoft with Street Racer, Konami with Konami Krazy Racers, Sony Computer Entertainment with Crash Team Racing, etc. Response to all these competing kart racers has been mixed: GameSpot stated that they tended to be bad, and 1UP.com said that their producers tried to improve upon the Mario Kart formula without success. Super Mario Kart was the first non-platforming game to feature multiple playable characters from the Mario franchise, leading the way for not only its various sequels but also the many other spin-offs that the Mario characters have appeared in, including both sporting games (those relating to tennis, golf, baseball, and soccer) and non-sporting games (Mario Party among other series). The genre-spanning nature of the Mario franchise that was sparked off by the success of Super Mario Kart has been described as key to Mario's success and longevity, keeping fans interested despite the infrequency of the traditional Mario platforming games. Mario Kart and all of the franchise's other spin-off series have helped it rise to its present status as the best-selling video game franchise of all time. ↑ Jones, Darran. "Super Mario Kart: The Complete History of Nintendo's Kart Racer". NowGamer. Imagine Publishing Ltd. November 28, 2011. ↑ Big N Magazine. p.19. July-August 2000. ↑ Campbell, Stuart. "How Refreshing! How Fruity!" RetroGamer. ↑ Nintendo Power Issue 250. Future US. 2010. p. 47. ↑ Ivan, Tom. "Guinness Ranks Top 50 Games of All Time". Computer and Video Games. March 14, 2009. ↑ Futter, Mike. "Mario Kart 8 Speeds to Over 1.2 Million Sales in Opening Weekend". Game Informer. June 2, 2014. ↑ Sales of individual games: Super Mario Kart: 9 million copies; Mario Kart 64: 9.87 million; Super Circuit: 5.91 million; Double Dash!! : 7 million; Mario Kart DS: 23.60 million; Mario Kart Wii: 36.83 million; Mario Kart 7: 13.94 million; Mario Kart 8: 8 million; Total sales: 114.15 million. ↑ Financial Results Briefing for the Fiscal Year Ended March 2014: Supplementary Information. Nintendo. May 8, 2014. ↑ "IGN's Top 100 Games". IGN. 2005. ↑ Ekberg; Brian; Montanari, Randall. "History of Mario Sports". GameSpot. ↑ 18.0 18.1 Hirandand, Ravi. "The Essential 50: #29". 1UP.com. This page was last edited on March 27, 2019, at 10:32.